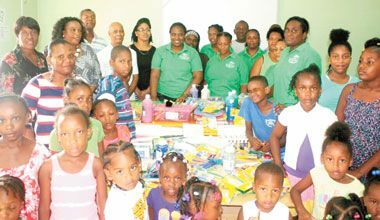 The Garifuna Indigenous People of St Vincent and the Grenadines Incorporated (GIPSVG Inc,) based in New York, United States, has donated school supplies to children of the Owia Community. On behalf of GIPSVG Inc, the items were handed over in the form of a presentation by representatives of the Lydia Indigenous Medical Foundation (LIMF), on Sunday, July 26. In response, Laverne Lavia, a teacher at the Owia Primary school and coordinator of the summer art programme, expressed deep appreciation for the items received, voicing her anticipation of an excellent programme this year. GIPSVG Inc was established in New York earlier this year with a mission aimed at the development of the people north of the Rabacca River and the successful implementation of sustainable projects geared towards the revitalization, maintenance and preservation of the culture. President of the organization Marsena Ballantyne has indicated that GIPSVG Inc intends to work closely with established community groups âNorth of the Riverâ to ensure the effective and efficient delivery of its projects.